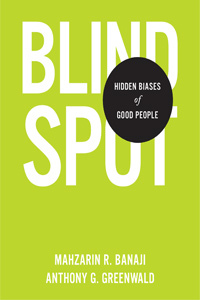 On October 28, 2013, we had a riveting Q&A Interview with Mahzarin Banaji, PhD, Richard Clarke Cabot Professor of Social Ethics in the Department of Psychology at Harvard University and co-author of the new book, Blindspot: Hidden Biases of Good People. Blind SpotWhy is it that reasonably well-intentioned people do things they never thought they would? “What if we’re not the magnanimous people we think we are?” asks The Washington Post’s Matthew Hutson. Experimental findings from the past few decades of social psychology research suggest that not only do we not know ourselves, but we might not want ourselves as friends or dinner partners if we did. Most of us (and our clients) are subject to irrational biases we consciously reject, yet which influence our social, professional, and community relationships–and our decision-making and ethics. Social psychologists Mahzarin R. Banaji and Anthony G. Greenwald, have collaborated for over 30 years in their search to understand how the mind operates in social contexts. Together with their colleague Brian Nosek, these two are co-developers of the Implicit Association Test, a method that transformed them, their research, and their field of inquiry. In Blindspot, research evidence from their labs and from the more than fourteen million completed tests at implicit.harvard.edu is made available to the general reader for the first time. Before reading on, you may want to join millions of others and take a test of your own biases. Go to implicit.harvard.edu and click on “Demonstration.” You’ll have a choice of a dozen or so tests (included are Weight, Age and Race IATs). This is an educational website deigned to create awareness of unconscious biases in self-professed egalitarians. Think you can outsmart the test developers? The Race IAT works like this: One at a time, it presents black faces, white faces, good words (“joy,” “love,” “peace,” etc.) and bad words (“evil,” “failure,” “hurt,” etc. ), and you must respond as quickly as possible by pressing one of two keys. If you work faster when good words are assigned to the same key as white faces, you purportedly prefer white people. The best indicator of the Implicit Association Test’s validity is its ability to predict behavior. An automatic white preference has been found to correlate with, for instance, suboptimal treatment of black emergency room patients, unfavorable judgment of black job applicants, laughter at racist jokes and voting for John McCain over Barack Obama. Scores on the Race IAT predict such discrimination even better than do overt statements about one’s beliefs. Banaji and Greenwald suspect that the discrepancy between implicit tests and explicit statements results in part from reputation management — people don’t want to express their biases openly — but mostly from dissonance reduction: They don’t want to admit their biases to themselves. Evidence presented in the new book Blind Spot suggests that our attitudes towards things like race, gender, sexuality, age, and politics are formed by “mindbugs”: learned habits that impair the brain’s ability to perceive things as they truly are. Banaji says that culture and societal interactions inform what our minds know. Many of us unknowingly hold racial biases, the starring bias of the book. Banaji and Greenwald propose that most of today’s racial discrimination stems not from attempts to harm anyone but from selective helping. We’re each part of several groups, defined by race, gender, religion, family, schooling, and so on, and when we selectively help an in-group member, we don’t view that as wrong. After all, we’re being “good” people. But such selective privileging reinforces the economic status quo and polarized thinking around race, gender and other categories. Carrying unconscious biases to jury duty or even to the office may have far-reaching, life-changing consequences. In a positive conclusion, Banaji and Greenwald argue that while we may not have much power to eradicate our prejudices, we are often capable of counteracting them. A first step is to turn a hidden bias into a visible one. Dr. Mahzarin Banaji earned her MA (1982) and PhD 1986) in Psychology (with a specialization in Social Psychology) from Ohio State University, and taught at Yale University from 1986-2002 where she was Reuben Post Halleck Professor of Psychology. Since then and at present she is Richard Clarke Cabot Professor of Social Ethics in the Department of Psychology at Harvard University and simultaneously George A. and Helen Dunham Cowan Chair in Human Dynamics at the Santa Fe Institute (2011-2014). She also served as the first Carol K. Pforzheimer Professor at the Radcliffe Institute for Advanced Study at Harvard from 2002-2008. In 2005, Mahzarin was elected fellow of the Society for Experimental Psychologists, in 2008 to the American Academy of Arts and Sciences and in 2009 was named Herbert A. Simon Fellow of the American Academy of Political and Social Science. She is also a fellow of the American Association for the Advancement of Science, the Association for Psychological Science (of which she was President). Mahzarin is devoted to undergraduate and graduate education, serving as Director of Undergraduate Studies at Yale, as Head Tutor at Harvard, and won Yale’s Lex Hixon Prize for Teaching Excellence. 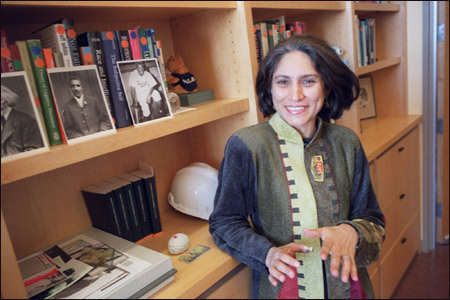 At both Yale and Harvard, she has been involved in dozens of faculty and university committees focused on faculty development, academic programs, ethics, and quality of education. Fellow professor Dan Gilbert describes Mahzarin as “one of the most celebrated, most cited, and most influential social psychologists of her generation for good reason–her work on unconscious bias has revolutionized how we think about the topic.” For her research, Mahzarin has been awarded a James McKeen Cattell Award, the Morton Deutsch Award for Social Justice, and fellowships from the John Simon Guggenheim Foundation, the Rockefeller Foundation, the Radcliffe Institute for Advanced Study and the Santa Fe Institute. 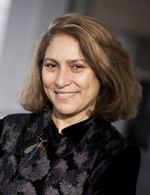 In addition, Mahzarin has received numerous grants from national and international institutions, is a sought-after international speaker with over three dozen invited lectures a year, has maintained active roles as editor, reviewer, and board member for numerous academic journals, and has contributed to over 400 book chapters, articles, and peer-reviewed conference papers. Her work has been recognized by receipt of a Gordon Allport Prize for Intergroup Relations, and her career contributions by a Presidential Citation from the American Psychological Association and the Carol and Ed Diener Award for Outstanding Contributions to Social Psychology. Mahzarin studies human thinking and feeling as it unfolds in social contexts. Her focus is primarily on mental systems that operate in implicit or unconscious mode. In particular, she is interested in the unconscious nature of assessments of self and other humans that reflect feelings and knowledge (often unintended) about their social group membership (e.g., age, race/ethnicity, gender, class) that underlie the us/them distinction. From such study of attitudes and beliefs of adults and children, she asks about the social consequences of unconscious thought and feeling. Mahzarin’s work relies on cognitive/affective behavioral measures and neuroimaging (fMRI) with which she explores the implications of her work for questions of individual responsibility and social justice in democratic societies. With Susan Gelman, Mahzarin edited Navigating the social world: What infants, children and other species can teach us, published in April, 2013 by Oxford University Press. Mahzarin’s current research interests focus on the origins of social cognition and applications of implicit cognition to improve organizational practices. Mahzarin’s website, Project Implicit with Anthony Greenwald and Brian Nosek. to create awareness about unconscious biases in self-professed egalitarians. • Mahzarin Banaji’s Situation: “A Chance Road to Harvard” BY Weigi Zhang. Originally in the Harvard Crimson. This one is really excellent.